There was never any in-between with Diana Vreeland the legendary fashion editor of American Harper’s Bazaar and later editor of American Vogue – you either loved her or hated her. The same goes for the documentary, Diana Vreeland: The Eye Has to Travel, written and directed by Lisa Immordino Vreeland, Brent-Jorgen Perlmutt and Frédéric Tcheng. Some won’t understand all the fuss about a woman frequently dismissive of those who didn’t meet her exacting standards. Equally those who revere Vreeland as the supreme ‘High Priestess of Fashion’ – who makes Vogue’s Anna Wintour look a pussycat in comparison – will love every morsel of this acidic and gossipy cocktail. 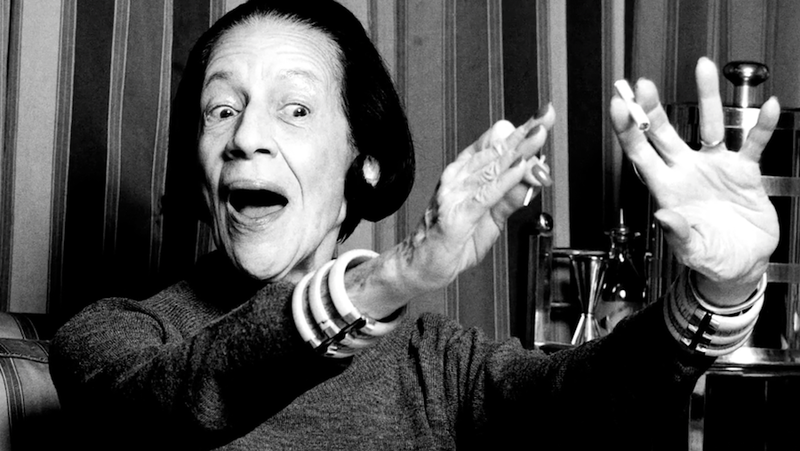 The film feels like a fast flick through one of the magazines Vreeland was famous for editing. Spliced with archive interviews with the woman herself discoursing on her colourful life – from an early childhood in Paris at the opening of the 20th century to her life in New York and career at Bazaar and then Vogue, before her rebirth as custodian of The Metropolitan Museum’s Costume Institute – this film gives a fascinating insight into one of the true icons of fashion. It also gives a mesmerising glimpse of many of the 20th century’s defining cultural moments. Stars who contribute snapshot memories to the film – from Angelica Huston to David Bailey – testify that though Vreeland was often a nightmare to work for she had an uncanny ability to capture the essence of the moment. As Vogue’s Grace Coddington grudgingly admits in The September Issue (2009), her boss Anna Wintour was right by starting the trend of putting celebrities on the magazine’s cover. After watching this film however, you will realise Vreeland went one better by discovering the celebrities, like Lauren Bacall, in the first place. Like many defined by their jobs, Vreeland’s family frequently took second place. Though she clearly adored her husband Thomas Reed Vreeland, her sons Tim and Frecky, who contribute here, appear to have had a distant relationship with Vreeland – likely due to the fact that she virtually lived for her job. Nonetheless all interviewed remember Vreeland with the affection one has for an eccentric old aunt. Diana Vreeland: The Eye Has to Travel (2011) will remind many why they will always have a hankering after the world of glossy fashion magazines and the exotic lifestyles of those who create them.